On May 31st, AVALON Hollywood’s CONTROL Friday will play host to some of the hottest up-and-coming DJs in dance music. Jaron and LUUDE will take to the stage to deliver a versatile mix of bass and trap beats, with local support from RWDY, ANTRA, Michael Brooks, and Rebecca Rocklynn. LA’s own Jaron gained popularity by way of dreamy future bass singles and a production ability spanning way beyond his years. After just two years in the music scene, the now 17-year-old DJ is booking top tier festivals and blowing away crowds with his sound. Jaron will share the spotlight with LUUDE, who keeps the future bass vibe going but with a trap-inspired twist. Hard bass drops, crazy samples, and smooth trap production are what audiences can expect from the Australian-born producer. Jaron and LUUDE will be joined by a slew of additional bass-loaded DJs. RWDY puts the pedal to the metal with hardstyle dubstep mixes, and ANTRA switches things up with a unique lo-fi trap sound. Michael Brooks lays hip-hop vocals over chilled out dance beats, and Rebecca Rocklynn will take to the stage to deliver an experimental trap set. 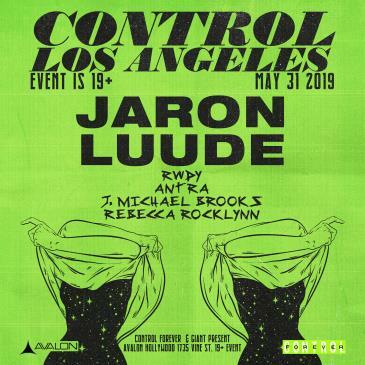 Grab your tickets from May 31st and catch Jaron, LUUDE, RWDY, ANTRA, Michael Brooks, and Rebecca Rocklynn for CONTROL Friday at AVALON Hollywood!